The Libraries invites you to a free lecture on Chinese Calligraphy to be held on 02 February 2017, Thursday, 2:00PM - 3:30PM at the Chinese Corner, The Learning Commons, 9th Floor Mezzanine, Henry Sy, Sr. Hall. 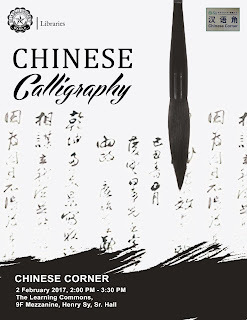 Ms. Keng Keng O. Lua, a member of the seven leading Filipino Artists, formed by Association for Philippine-China Understanding (APCU), was invited to provide an overview of the traditional Chinese visual art in the form of calligraphy. Participants will also be given the opportunity to practice calligraphy. Online registration is required due to limited number of slots. Interested participants are requested to kindly fill out this online registration form. Registration ends at 8:00AM on 02 February 2017. For inquiries, you may Chat with LORA, send an email to library@dlsu.edu.ph, or contact The Libraries, at local 620. Its regular hours and services will resume on Monday, 06 February 2017. This video “examines what it means to be autistic, how parents can recognize signs of autism in their children, and what new treatments and programs are available to help with this disorder” (source video). This documentary television program narrates that “with exclusive access to British Petroleum’s cleanup operations, National Geographic investigates what happened to the 4.9 million barrels of oil that poured from the sea floor in one of the worst environmental disasters of all time” (source video).